The last of the Lucy’s Make-up series! Sad times!! Bit of a sparse collection for lips, I’m not much of a lippy wearer although I am determined to change that! I’m deffo more of a subtle gloss girl that bold lip. Rimmel Kate Moss Lipstick in 003 was my first proper lipstick and I wasn’t too impressed, the colour is a nudey brown, not suited to me at all and I found it to be quite drying on the lips. I really like Rimmel Apocalips in Luna, it’s a lovely peachy shade with high gloss. Although it is pretty thick and sticky. I’d like to try a few other colours in this range. 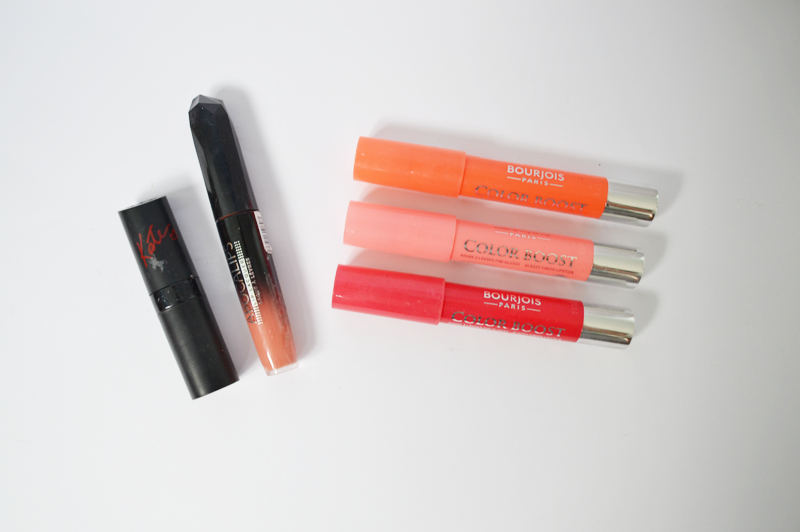 As you can see, I am a big fan of the Bourjois Colour Boosts. All of which are lovely colours, and I really like to mix Orange Punch and Peach on the Beach together. These give the most gorgeous amount of colour and a lovely sheen. I also like how it doesn’t require you to look in a mirror when applying them like you would with a red lipstick. So that’s it! I hope you liked nosing into my make-up collection and enjoyed this mini series.